Elliott's One-Piece Tube Plugs cover a wide tube OD range, making them ideal for sealing leaky tubes in both heat exchangers and boilers. It is good practice to install a plug that is the same as or a compatible material to the tube to be plugged. The tube plugs are available in an array of materials to suit your needs: brass, carbon steel, 304 stainless steel, 316 stainless steel, 416 stainless steel, aluminum, and monel (other materials are available upon request). Elliott recommends puncturing the leaky tube with a One-Revolution Tube Cutter. See ”One-Revolution Tube Cutter” on page 2 of the Tube Removal Catalog. This will ensure the tube is properly vented prior to plugging. Quick method to plug leaky tubes – less labor cost. Easy to weld to tube sheet – peace of mind. Plug covers multiple tube sizes – less inventory cost. Specifications vary upon tube size and tube plug material. Contact Customer Service for details. Elliott's Two-Piece Tube Plugs offer more sealing compared to One-Piece Plugs. The tapered pin is driven into the ring, which is tapered on the inside and is parallel to the tube on the outside. This gives even expansion to the ring and a long contact to the seal. It is good practice to install rings and pins that are the same as or a compatible material to the tube to be plugged. The tube plugs are available in an array of materials to suit your needs: brass, carbon steel, 316 stainless steel, 416 stainless steel, and aluminum (other materials are available upon request). Elliott recommends puncturing the leaky tube with a One-Revolution Tube Cutter. This will ensure the tube is properly vented prior to plugging. Better method to plug leaky tubes – less labor cost. Pins fit several ring sizes – less inventory expense. Larger sealing surface – less chance for repeat leaking. Does not damage the tube sheet – No tube sheet repair cost. Specifications vary upon tube size and plug material. Contact Customer Service for details. Elliott's High Pressure Tube Plugs provide positive sealing in excess of 6,500 PSI (448.2 bar), making them ideal for high pressure applications such as feedwater heaters and other high pressure heat exchangers over 200 PSI (13.8 bar). As the most secure method to plug leaky tubes, they can also be used in low pressure applications for peace of mind. Setup of the High Pressure Tube Plugs is fast and easy because the plug is installed without a hydraulic ram. With only a plug and hand torque wrench, the operator is ready to plug tubes. Simply insert the plug into the tube sheet of a leaking tube and expand with a standard 3/8” drive torque wrench. The plug will expand approximately 0.030” (0.76mm) to provide a positive mechanical contact seal. The one piece design allows for operators to easily plug tubes in tight spaces like hemispherical heads, baffle plates, and dividers. 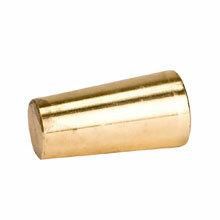 It is good practice to install tube plugs that are the same as or a compatible material to the tube and tube sheet. The tube plugs are available in an array of materials to suit your needs: brass, carbon steel, stainless steel, titanium, monel, and copper nickel. Elliott recommends puncturing the leaky tube with a One-Revolution Tube Cutter. This will ensure the tube is properly vented prior to plugging. 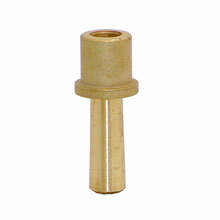 Expands in tube – can be installed into hard to reach areas. Most secure method to plug leaky tubes – peace of mind. No expensive capital equipment required – low investment. Tested to 6,500 PSI (448.2 bar) – use in feedwater units and other high pressure vessels. Pressure: Positive sealing in excess of 6,500 PSI (448.2 bar). 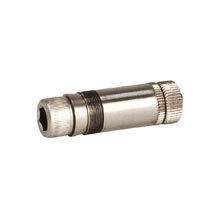 5” for 1/4” and 5/16” drive.